Did you know that there are currently more than 116,000 people waiting for an organ donation? Did you also know that an average of 20 people die each day while on the waiting list for an organ donation? MORA and Donate Life MS are working to raise awareness on the issue of organ, eye, and tissue donation. To do your part, please take advantage of the various options we’ve created to help supporters like you get the word out about donation! 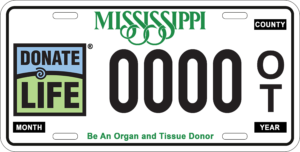 We’ve got a Donate Life Mississippi specialty car tag. You may order your plate with the county Tax Collector at the time you register your vehicle. Standard personalized plates require an additional annual fee of $31. There are various rates for specialty plates. A list of all specialty license plates is available on the Mississippi Department of Revenue website. The Donate Life MS specialty car tag is $31. In May of 2012, Facebook added the ability for you to let others know you are an organ and tissue donor through your timeline. You can also access links to Register to become an organ and tissue donor through the site. If you’ve registered previously and would like to let others know that you’re an organ and tissue donor on Facebook, here are the steps you need to take. This will bring up a dialog which allows you to define Where, When, and add a description. This dialog also provides links to learn more about organ and tissue donation. Facebook has more information on their Organ Donor Initiative. Show your support on Facebook and/or Twitter by adding an overlay to your profile pic! Click here to add a Donate Life twibbon.